My body is ready. I feel like this little one is trying to break out! My house is not at all ready. And emotionally I don’t know if you are ever really “ ready”… are you? This second time around is so different. Last time at this point I was still running around full speed ahead. I feel like I had NO IDEA what was to come. Everyone said my life was about to change but I didn’t really get it. I also had no idea that I was about to have the absolute best moment of my life… when they handed me my baby boy for the very first time. The absolute best moment of my life so far. When they put Christian on my chest for the first time. Thinking back, at this point just days before giving birth last time, I was worried about my hair being done and what I was going to wear in the hospital (I wish I could find that robe selection I bought!) and of course having a healthy baby. I was worried how my dog Saint would take to having a baby in the house. I packed my regular pre-pregnancy clothes to wear home from the hospital. I had no idea I would still look pregnant for weeks to come! And I had no idea my blown up feet and legs would get even more swollen before they got better. 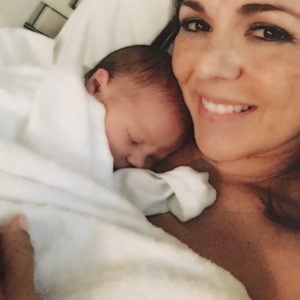 I didn’t think about recovery or what it would be like when I got home… with a baby. I had all sorts of big plans! I thought I would be out and about baby in arms or stroller in no time. Just like all the moms on Insta. Not so much. I thought maternity leave was going to be a vacation… it was magical in many ways and I am so grateful for it… but a vacation it was not. I didn’t know how difficult a recovery from a C-section would be for me. How tough it would be to get around and just how much help I would need. I didn’t think much about breast feeding and felt it would just happen if it was meant to- I had no idea how challenging it would be for me, how determined I’d be to do it, and how confused I would be when one nurse said I was starving my child and should supplement and another came in and said I shouldn’t and made me feel like a horrible mother and the first lactation consultant that came in had me in tears and wanting to give up (Btw- did end up supplementing and breast feeding for over a year) . 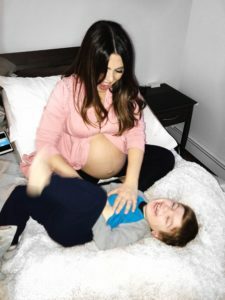 I felt like I didn’t know how to do anything – I had only changed one diaper before Christian’s, I had no idea how to swaddle and just felt like I was failing… and that was before I even got home. And… I had no idea how emotional I would be once I did get home. Suddenly I was in charge of this little life, feeling an overwhelming love and had fears and worries I had never ever experienced. My mom stayed with me for a week. I was in hysterics when she went home and suddenly it was all up to me. My husband was home as much as he could be but we had just opened Mo’NElisa that same week (Christian was early, building work was really late). I would sit with Christian in the rocking chair and just cry for no reason about how much I loved him. After getting all of this attention and everyone checking on me, I began to feel so alone. 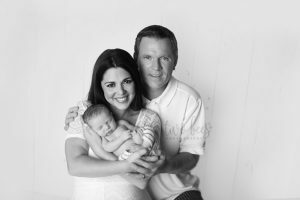 It was so much tougher taking care of a newborn than I ever imagined. I wanted so badly to do everything right. And then there was the whole other issue and pressure to lose that baby weight- I felt like when I finally did get out of the house after a few weeks I was looked up and down. I barely had time to eat, let alone eat healthy. Forget about getting to a gym once I was healed. I could not figure out how to take care of myself and a newborn. So I didn’t take care of myself. I felt awful. I just kept thinking what’s wrong with me? Why can everybody else do this no problem and it’s so hard for me? This time around I know what to expect. I don’t know if that’s a good or bad thing… I’m definitely much more nervous about going into the hospital, the surgery and the recovery. But now I know that I will need help, I’m not as afraid to ask for it and think I have the help I need at home. Lately I have been sitting in the rocking chair with Christian across my belly crying again about how much I love him. I am so worried about leaving him for a few days, although I know he’ll be well taken care of, I don’t want him to feel abandoned in any way. I can’t stop thinking about how I’ll actually introduce him to the baby, when is the best time to have him come to the hospital, I cry thinking about how he’ll have to leave me in the hospital and of course I’m so worried about how he’ll adjust to being a big brother. I have presents for him wrapped and ready to go. We’ve read big brother books & watched the Daniel Tiger episode when his mommy has a baby 10 times over. I don’t know what else to do to prepare him… or myself. I’m also nervous about not being able to take care of him and pick him up when I get home. I could cry- okay I am crying- just thinking about it. And what will our new normal be as a family of 4? I know there’s so much out of my control. So I’m trying to control what I can control and that’s giving Christian all the love and attention I can and getting as much as I can “ready” to ease my anxiety & oh yes, taking care of myself. I learned this past year that you can’t really take care of anyone else if you don’t take care of yourself first. That I will definitely do a better job of this time. I’m trying my best to breathe, replace all of these fears with love and excitement. It does feel good to release it here. Let go of the fears. And be grateful. Thank you for being on this journey with me and for all of the love and advice in your Instagram comments- I read and take in each and every one- and again, am very grateful. I’ll keep you all posted… any day now!